The Missouri National Guard deployed to the St. Louis region on Tuesday, one day after Governor Jay Nixon declared a state of emergency. 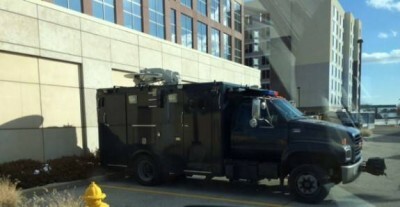 Military vehicles were seen in St. Louis City and in West County. CERFP Enhanced Response Force Package assets were spotted in Chesterfield in West County. The vehicles are used for CBRNE events: chemical, biological, radiological, nuclear and high yield explosive events. The Missouri Guard owns several of these vehicles and that’s what they chose to call up for the State of Emergency. About ten states own these vehicles, Missouri being one of them. The ten states correspond to the 10 FEMA regions. The program was funded by the Feds. Hopefully, they will not actually need these vehicles.